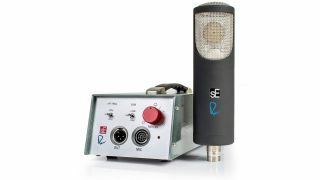 MUSIKMESSE 2015: sE Electronics has joined forces with studio god Rupert Neve once more to create the RNT multi-pattern tube microphone. The large diaphragm mic has a huge 153dB of headroom and comes with a Class-A floor box amplifier, which has three gain settings and three high pass filter options. Check out the full press release below for more detailed information and tech specs. The RNT, a large-diaphragm multi-pattern tube microphone designed with Mr. Rupert Neve. Over ten years in development, the RNT is the latest product to come from the relationship between sE Electronics and Rupert Neve Designs. It combines a high-voltage tube circuit within the microphone itself, a floor box with a discrete, class-A amplifier circuit using the same custom op-amps as Rupert Neve Designs' flagship 5088 analogue mixing console, two of Rupert's custom transformers, and a custom mic capsule designed by sE to provide extreme headroom (153dB) and high-bandwidth frequency response. Given its substantial headroom, the mic has no need for a pad, but the amplifier circuit in the floor box has three gain settings of -12dB, 0dB (flat), and +12dB. The floor box also has a three-position high-pass filter at 40Hz, 80Hz, and 0 (off), and a nine-way selector switch to vary the polar pattern from omni to cardioid to figure-8, with several steps in between each.